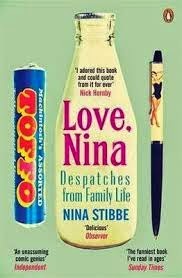 This one has an odd and perhaps unpromising premise: subtitled 'Despatches from Family Life', Nina Stibbe's first book is a collection of her letters to her sister about her experiences as a nanny to a literary London family in the 1980s is enormously funny, with the highlights a series of dry and bizarre conversations. In the words one of the recurring figures, Alan Bennett, "It's funny. I'm not sure what it's about. A bunch of literary types doing laundry and making salad - or something." Love, Nina is a great holiday read (a great read full stop - it would cheer you up in the depths of winter too).